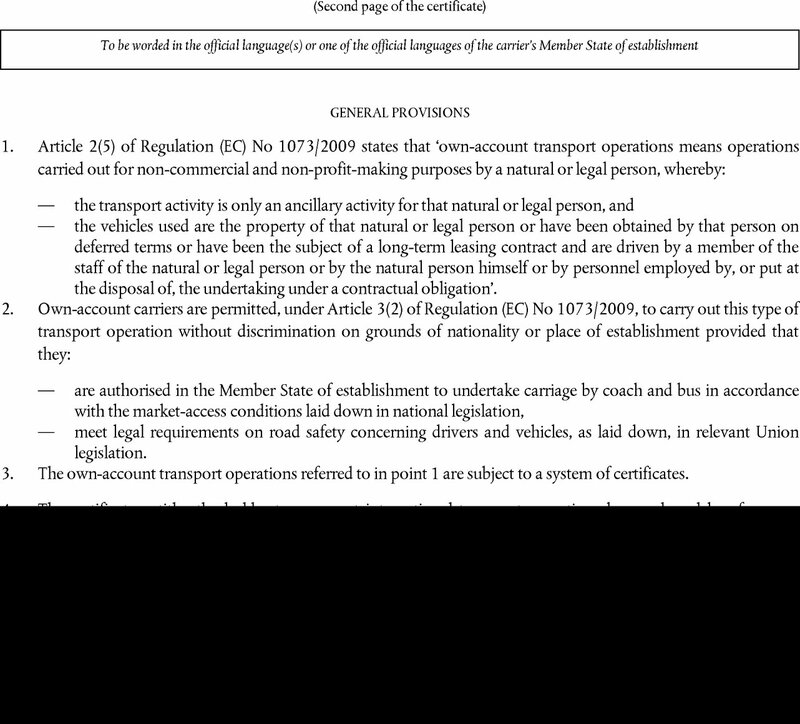 The measures provided for in this Regulation are in accordance with the opinion of the Committee on Road Transport. 1. The control document (journey form) for the occasional services defined in Article 2(4) of Regulation (EC) No 1073/2009 shall conform to the model in Annex I to this Regulation. 2. The journey forms shall be in books of 25 forms, in duplicate, and detachable. Each book shall bear a number. The forms shall also be numbered from 1 to 25. The cover of the book shall conform to the model in Annex II. Member States shall take all necessary measures to adapt these requirements to computerised processing of journey forms. 1. The book referred to in Article 1 shall be made out in the name of the carrier and it shall not be transferable. 2. The journey form shall be filled out legibly in indelible letters, in duplicate, either by the carrier or by the driver for each journey prior to departure. It shall be valid for the entire journey. 3. The top copy of the detached journey form shall be kept on the vehicle during the whole of the journey to which it refers. A copy shall be kept at the company's base. 4. The carrier shall be responsible for keeping the journey forms. In the case of an international occasional service provided by a group of carriers acting on behalf of the same contractor, and which may include the travellers catching a connection en route with a different carrier of the same group, the original of the journey form shall be kept on the vehicle carrying out the service. A copy of the journey form shall be kept at the base of each carrier. 1. Copies of the journey forms used as control documents for cabotage operations in the form of occasional services pursuant to Article 15(b) of Regulation (EC) No 1073/2009 shall be returned by the carrier to the competent authority or agency in the Member State of establishment in accordance with procedures to be laid down by that authority or agency. 2. 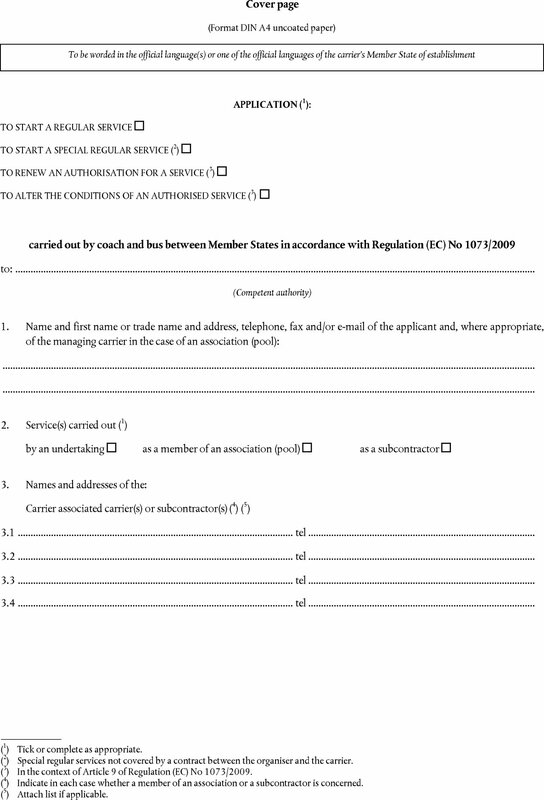 In the case of cabotage operations in the form of special regular services pursuant to Article 15(a) of Regulation (EC) No 1073/2009, the journey form in Annex I to this Regulation shall be completed in the form of a monthly statement and returned by the carrier to the competent authority or agency in the Member State of establishment in accordance with procedures to be laid down by that authority or agency. 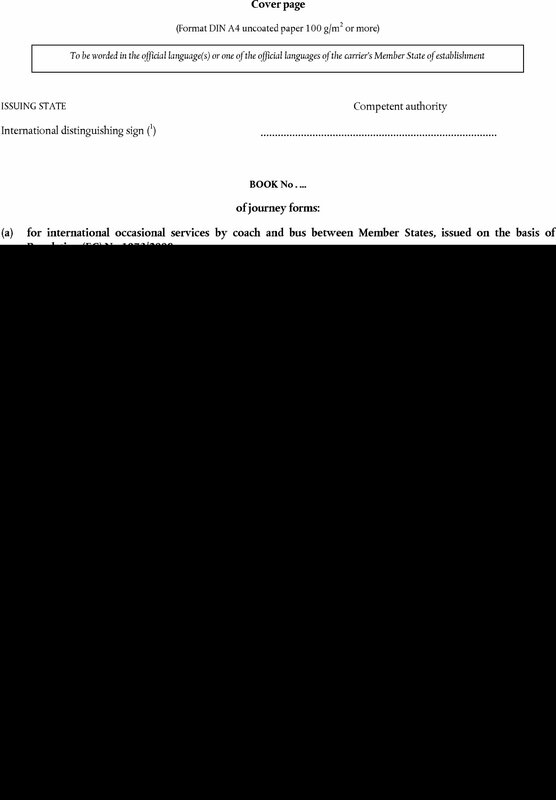 The journey form shall enable the holder, in the course of an international occasional service, to carry out local excursions in a Member State other than that in which the carrier is established, in accordance with the conditions laid down in the second subparagraph of Article 13 of Regulation (EC) No 1073/2009. 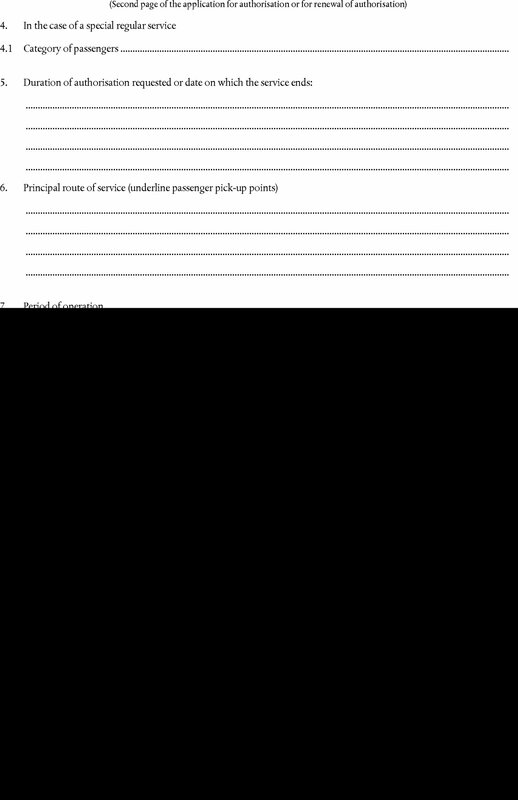 The local excursions shall be entered on the journey forms before the departure of the vehicle on the excursion concerned. The original of the journey form shall be kept on board the vehicle for the duration of the local excursion. The control document shall be presented at the request of any authorised inspecting officer. 1. Applications for authorisation of regular services and special regular services subject to authorisation shall conform to the model in Annex III. a driving schedule to permit verification of compliance with the Union legislation on driving time and rest periods. 3. Applicants shall provide any further information which they consider relevant or which is requested by the issuing authority in support of the application. 1. Authorisations shall conform to the model in Annex IV. 2. Each vehicle carrying out a service subject to authorisation shall have on board an authorisation or a copy certified by the issuing authority. 3. Authorisations shall be valid for a maximum of five years. 1. Certificates for the own-account transport operations defined in Article 2(5) of Regulation (EC) No 1073/2009 shall conform to the model in Annex V to this Regulation. 2. Undertakings requesting a certificate shall provide the issuing authority with evidence or an assurance that the conditions laid down in Article 2(5) of Regulation (EC) No 1073/2009 have been met. 3. Each vehicle carrying out a service subject to a system of certificates shall carry on board for the duration of the journey a certificate or its certified true copy, which shall be presented at the request of any authorised inspecting officer. 4. Certificates shall be valid for a maximum of five years. 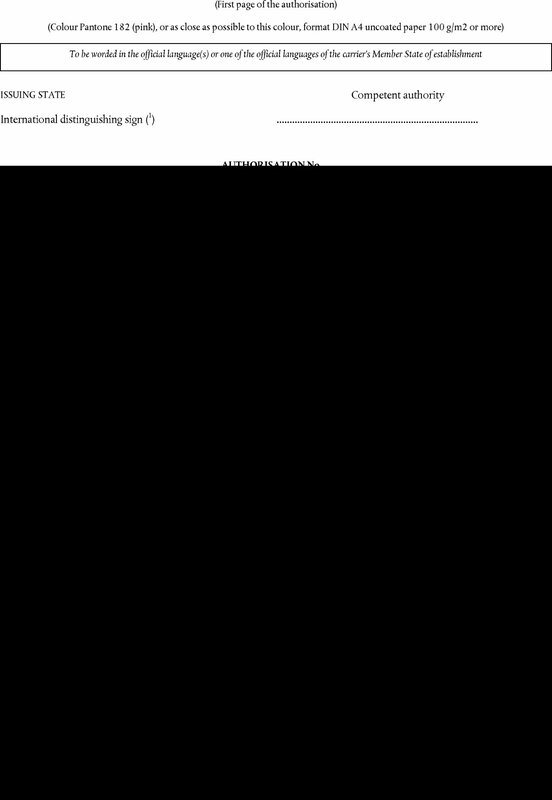 The data on cabotage transport operations referred to in Article 28(2) of Regulation (EC) No 1073/2009 shall be communicated in in the form of a table in accordance with the model in Annex VI to this Regulation. 1. Member States may authorise the use of existing stocks of the journey forms, applications for authorisation, authorisations and certificates drawn up in conformity with Regulation (EC) No 2121/98 until 31 December 2015. 2. The other Member States shall accept the journey forms and the applications for authorisation on their territory until 31 December 2015. 3. The authorisations and certificates drawn up in conformity with Regulation (EC) No 2121/98 and issued before 31 December 2015 will remain valid until the date of their expiry. Regulation (EC) No 2121/98 is repealed. (2) OJ L 268, 3.10.1998, p. 10. 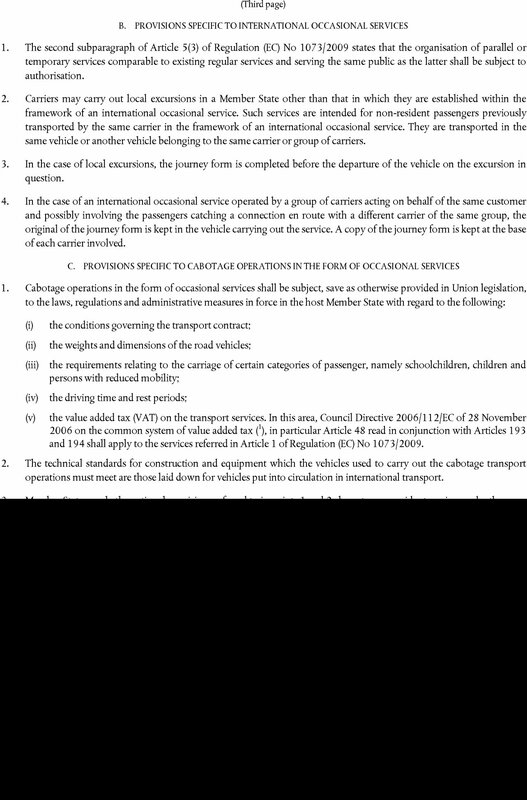 (b) for cabotage operations in the form of occasional services carried out in a Member State other than that in which the carrier is established, issued on the basis of Regulation (EC) No 1073/2009. (1) Austria (A), Belgium (B), Bulgaria (BG), Croatia (HR), Cyprus (CY), Czech Republic (CZ), Denmark (DK), Estonia (EST), Finland (FIN), France (F), Germany (D), Greece (GR), Ireland (IRL), Italy (I), Latvia (LV), Lithuania (LT), Luxembourg (L), Hungary (H), Malta (M), Netherlands (NL), Poland (PL), Portugal (P), Romania (RO), Slovakia (SK), Slovenia (SLO), Spain (E), Sweden (S), United Kingdom (UK). 1. Article 12(1), the second paragraph of Article 5(3) and Article 17(1) of Regulation (EC) No 1073/2009 state that occasional services shall be carried out under cover of a control document (journey form detached from the book of journey forms issued to a carrier). 2. Article 2(4) of Regulation (EC) No 1073/2009 defines occasional services as services ‘which do not fall within the definition of regular services, including special regular services, and the main characteristic of which is the carriage of groups of passengers constituted on the initiative of a customer or the carrier himself’. Regular services are defined in Article 2(2) of Regulation (EC) No 1073/2009 as ‘services which provide for the carriage of passengers at specified intervals along specified routes, passengers being picked up and set down at predetermined stopping points.’ Regular services are open to all, subject, where appropriate, to compulsory reservation. The regular nature of the service is not affected by any adjustment to the service operating conditions. (b) the carriage of school pupils and students to and from the educational institution. The fact that a special service may be varied according to the needs of users does not affect its classification as a regular service. 3. The journey form is valid for the entire journey. (ii) cabotage operations in the form of occasional services in a Member State other than that in which the carrier is established. 5. The journey form is completed in duplicate, either by the carrier or by the driver before the beginning of each service. The copy of the journey form remains in the undertaking. The driver keeps the original on board the vehicle throughout the journey and presents it on request to enforcement officials. 6. The driver returns the journey form to the undertaking which delivered it at the end of the journey in question. The carrier is responsible for keeping the documents. They are filled in legibly and indelibly. 1. The second subparagraph of Article 5(3) of Regulation (EC) No 1073/2009 states that the organisation of parallel or temporary services comparable to existing regular services and serving the same public as the latter shall be subject to authorisation. 2. Carriers may carry out local excursions in a Member State other than that in which they are established within the framework of an international occasional service. Such services are intended for non-resident passengers previously transported by the same carrier in the framework of an international occasional service. They are transported in the same vehicle or another vehicle belonging to the same carrier or group of carriers. 3. In the case of local excursions, the journey form is completed before the departure of the vehicle on the excursion in question. 4. 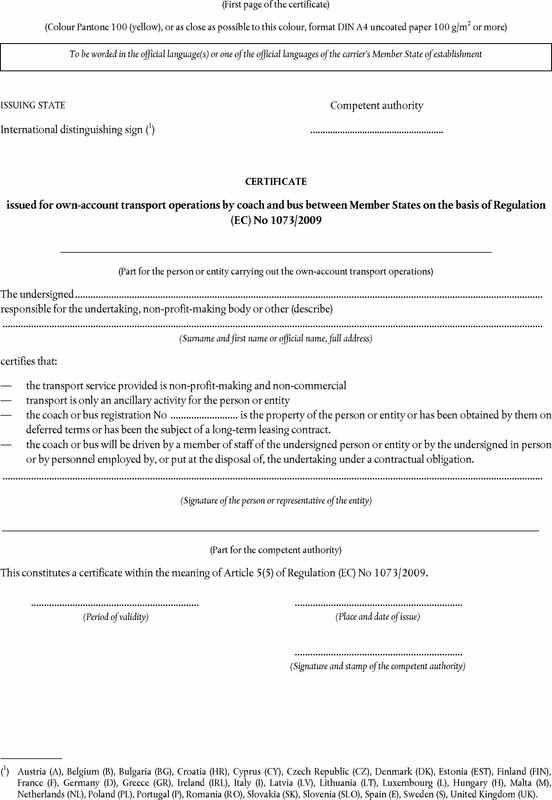 In the case of an international occasional service operated by a group of carriers acting on behalf of the same customer and possibly involving the passengers catching a connection en route with a different carrier of the same group, the original of the journey form is kept in the vehicle carrying out the service. A copy of the journey form is kept at the base of each carrier involved. (v) the value added tax (VAT) on the transport services. In this area, Council Directive 2006/112/EC of 28 November 2006 on the common system of value added tax (1), in particular Article 48 read in conjunction with Articles 193 and 194 shall apply to the services referred in Article 1 of Regulation (EC) No 1073/2009. 2. The technical standards for construction and equipment which the vehicles used to carry out the cabotage transport operations must meet are those laid down for vehicles put into circulation in international transport. 3. 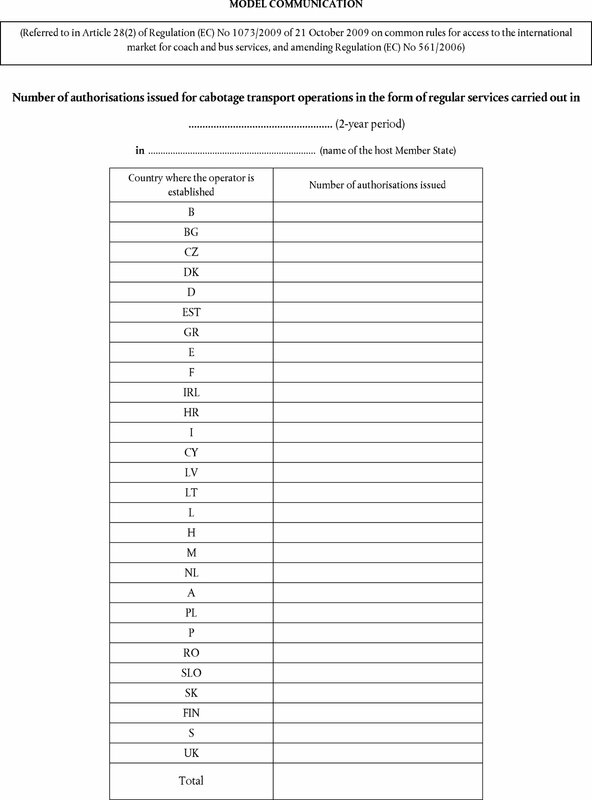 Member States apply the national provisions referred to in points 1 and 2 above to non-resident carriers under the same conditions as those imposed on carriers established in the host Member State, in order to prevent any discrimination on grounds of nationality or place of establishment. 4. In the case of cabotage operations in the form of occasional services, the journey forms are returned by the carrier to the competent authority or body of the Member State of establishment in accordance with procedures to be laid down by that authority or body (2). 5. 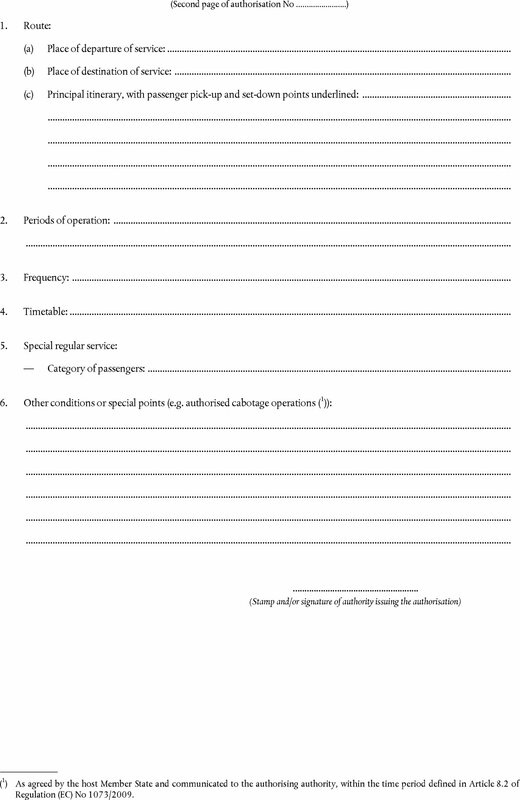 In the case of cabotage operations in the form of special regular services, the journey forms shall be filled out in the form of a monthly statement and returned by the carrier to the competent authority or body of the Member State of establishment in accordance with procedures to be laid down by that authority or body. (2) Member States’ competent authorities may supplement point 4 with personnel of the agency responsible for collecting the journey forms and the procedure for forwarding the information. (1) Tick or complete as appropriate. (2) Special regular services not covered by a contract between the organiser and the carrier. (3) In the context of Article 9 of Regulation (EC) No 1073/2009. (4) Indicate in each case whether a member of an association or a subcontractor is concerned. (5) Attach list if applicable. (1) The attention of the applicant is drawn to the fact that, since the authorisation has to be kept on board the vehicle, the number of authorisations which the applicant must have should correspond to the number of vehicles needed for carrying out the service requested at the same time. (f) a driving schedule to permit verification of compliance with the Community legislation on driving and rest periods. 2. Applicants shall provide any additional information in support of their application which they consider relevant or which is requested by the issuing authority. (a) regular services, services which provide for the carriage of passengers at specified intervals along specified routes, passengers being picked up and set down at predetermined stopping points. Regular services shall be open to all, subject, where appropriate, to compulsory reservation. The regular nature of the service shall not be affected by any adjustment to the service operating conditions. (ii) the carriage of school pupils and students to and from the educational institution. The fact that a special service may be varied according to the needs of users shall not affect its classification as a special regular service. 4. 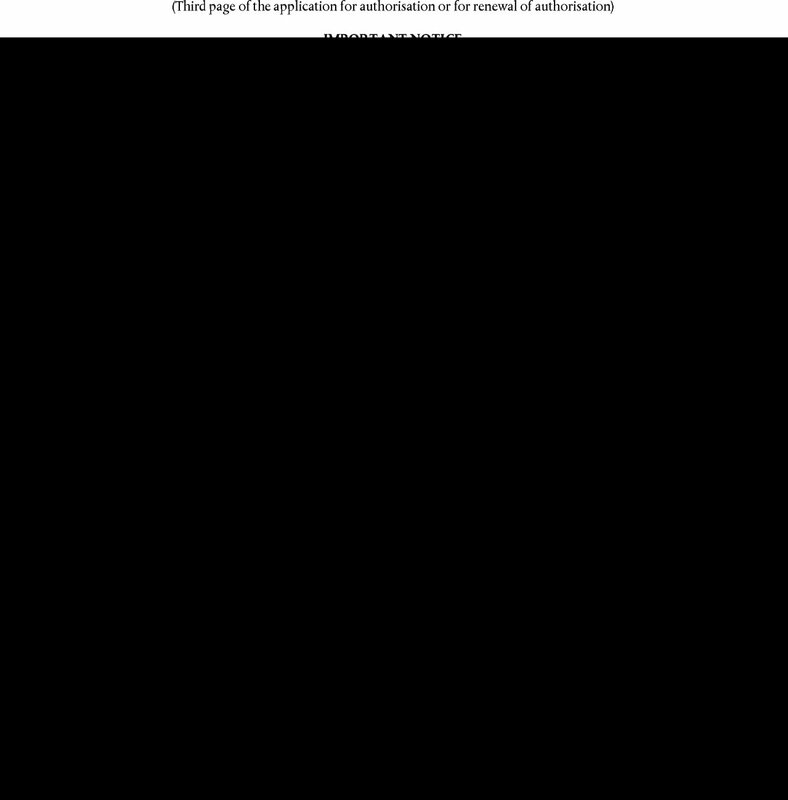 The application shall be made to the competent authority of the Member State from which the service departs, namely one of the service termini. 5. The maximum period of validity of the authorisation is five years. (1) As agreed by the host Member State and communicated to the authorising authority, within the time period defined in Article 8.2 of Regulation (EC) No 1073/2009. 1. This authorisation is valid for the entire journey. It may only be used by a party or parties whose name is indicated thereon. 2. The authorisation or a true copy certified by the issuing authority is kept in the vehicle for the duration of the journey and is presented to enforcement officials on request. 3. A true certified copy of the Community licence is kept on board the vehicle. — the coach or bus registration No is the property of the person or entity or has been obtained by them on deferred terms or has been the subject of a long-term leasing contract. — the coach or bus will be driven by a member of staff of the undersigned person or entity or by the undersigned in person or by personnel employed by, or put at the disposal of, the undertaking under a contractual obligation. This constitutes a certificate within the meaning of Article 5(5) of Regulation (EC) No 1073/2009. — the vehicles used are the property of that natural or legal person or have been obtained by that person on deferred terms or have been the subject of a long-term leasing contract and are driven by a member of the staff of the natural or legal person or by the natural person himself or by personnel employed by, or put at the disposal of, the undertaking under a contractual obligation’. — meet legal requirements on road safety concerning drivers and vehicles, as laid down, in relevant Union legislation. 3. 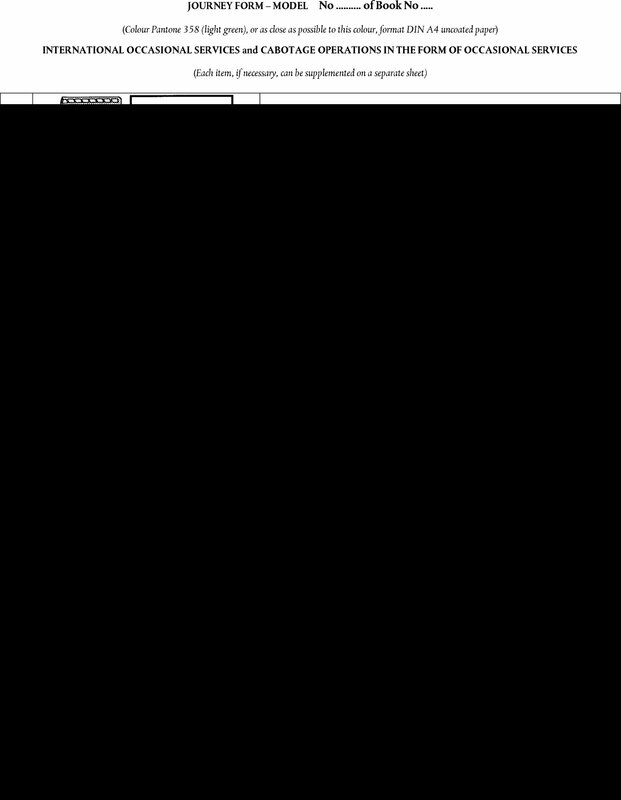 The own-account transport operations referred to in point 1 are subject to a system of certificates. 4. The certificate entitles the holder to carry out international transport operations by coach and bus for own-account. It is issued by the competent authority of the Member State where the vehicle is registered and is valid for the entire journey, including any transit journeys. 5. The relevant parts of this certificate are completed in indelible letters in triplicate by the person or the representative of the entity carrying out the operation and by the competent authority. One copy is kept by the administration and one by the person or entity. The driver keeps the original or a certified true copy on board the vehicle for the entire duration of any international journeys. It is presented to the enforcement authorities on request. The person or entity, as appropriate, is responsible for keeping the certificates. 6. The certificate is valid for a maximum of five years.